1. Water and its soothing undulations inform much of Zadie Xa’s practice. Growing up surrounded by the Pacific Ocean and later heavily influenced by Korean marine life, Xa views water as both metaphor and material: it is a universal, abstract reminder of a home that is both fixed in place and drifting in uncertainty. It is also a conduit for Xa’s artistic expression, as she researches, uses, and is inspired by aquatic material culture and folklore in her artworks. Oceanic depths and ecologies are sites of tension in Xa’s practice, inspiring a recollection of memories that are at once fantasies and realities. 2. A sizeable, spiked conch shell sits in the centre of a darkened room, illuminated in a pulsing enigmatic glow. Worn-out, yet machine-like, it is as if it were jettisoned from the water’s surface and sunk to a deserted seabed. Its grand spiral seems to orbit into another world; its light a beacon for aimless travellers. Sea shells are contrarian things: they incite our imagination through the alluring echoes of waves that we might actually hear, or blithely fantasize into existence. Yet, they are grounded in an earthy pragmatism – as literal homes to creatures of sea and shore. Home, however, is neither static nor fully realized. Like the creatures who mobilize shells as their itinerant homes, Xa uses the motif of a shell to confound expectations of fixity and place. For the artist, the spiralling conch poses a cyclic conundrum: circling back to an elusive origin that is both comforting and unknown, familiar yet estranged. 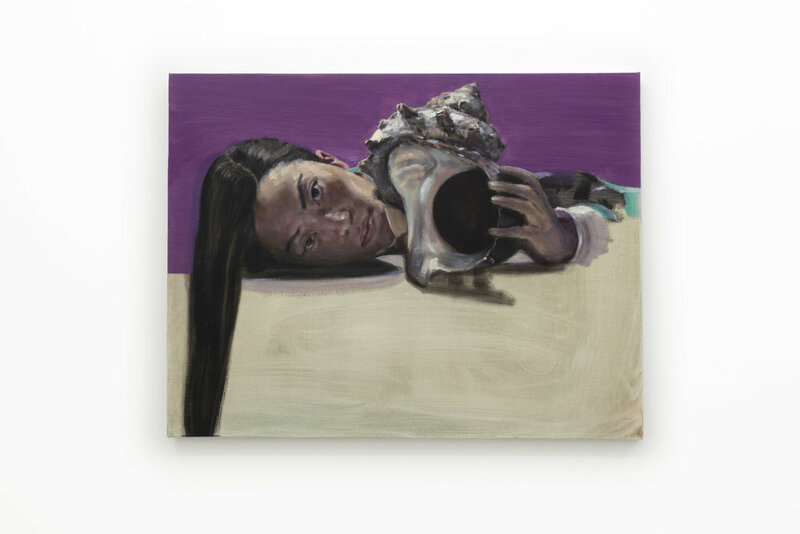 In previous artworks, Xa has imagined the conch as her mother’s mysterious birthplace, thus cementing the intertwined importance of family and fantasy in her practice. The conch also figures heavily in Xa’s symbolic arsenal as it is an integral part of daily life and sustenance in Korea. Specifically, she is drawn to the formidable figures of the haeneyo women divers of Jeju Island, who specialize in harvesting and preparing conches for consumption. Conches are an everyday delicacy in Jeju, commonly eaten raw with pepper paste and raw garlic. Intriguingly, for Xa, the conch conjures overlapping vignettes of fictional and factual home. 3. Life-times are like waves, ebbing and flowing before reaching an unfulfilling, moribund climax, only to surge forth again in another torrent or cluster of vitality. There are many complex conceptions and processes of world-making that do not adhere to the clarity of a linear life, one that does not incorporate the different contours and porosities of space, time, subjectivity, and kinship that prefigure assimilated definitions of the ‘real’ and ‘human’. The hygienic punctuations of life can therefore be conceived of as implausible. 4. In Xa’s practice, magic and the occult provide a means of traversing and redefining ‘acceptable’ existential signposts. Quixotic, arcane practices not only destabilize ossified ideas and representations of home, but also question and warp the very logics of their normalization. At first glance, Xa’s elaborate textile works look like ornate wall pieces only to be appreciated from a distance. However, she actually envisions them as utilitarian garments, defensive armature or battle gear that wearers don for adventures like space-time travel and deep-sea dives. Xa even incorporated the numerical longitude and latitude of Jeju Island on a previous garment piece and her aggrandized conch sculpture, as if reminding herself to always visit one of her many homes on her wild perambulations. 5. Knives are another recurring motif in Xa’s patchworked textiles. Blood-thin, they invoke two quite opposite spheres of life: the razor-sharp knives used to prove omnipotence, power, and successful possession during Korean shamanistic rituals, and the ordinary kitchen knives that Xa’s mother used in their home. In Xa’s functional fashions, the occult exists uncannily alongside the domestic, mutating and reconfiguring ideals of kinship. A shaman’s knife becomes a mother’s. Xa also references bogaji, or Korean wrapping cloths, in one of her new textile pieces. Aesthetically, bogaji utilize a striking variety of colours and abstract shapes, visually reminiscent of Xa’s intricate textile works. Interestingly, bogaji serve a primarily practical function. They are commonly used to wrap, contain, and protect everyday items such as household goods and food boxes that in turn provide nourishment. Like the spiralling conch that Xa consistently returns to in her artworks, these textile pieces perform an introspective self-referentiality: alluding to various permutations of ‘home’ and familiarity as they themselves house and provide comfort for strange, foreign inhabitants.